The former Irish international joins Ray Wilkins’ coaching team. 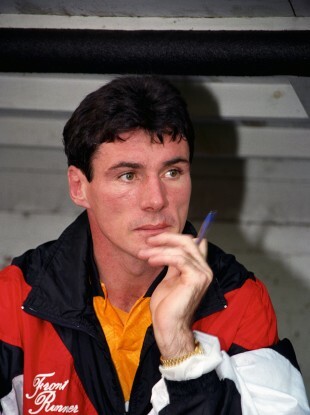 Frank Stapleton during his time in charge of Bradford. FORMER REPUBLIC OF Ireland striker Frank Stapleton has been appointed as assistant manager of the Jordan national team to serve alongside new boss Ray Wilkins. Stapleton, who won 71 caps with Ireland, and Wilkins will take charge from next week after friendlies with China and Uzbekistan. Stapleton – who won FA Cups with both Arsenal and Manchester United – first turned to coaching with Bradford in 1991. He spent four seasons with the club winning 47 of his 129 games in charge. It will be Wilkins’ first head coaching role in football since a caretaker spell in charge of Chelsea in 2009 but the some time Sky Sports pundit has some international experience having been assistant to Peter Taylor with the England U21s. Email “Frank Stapleton announced as new Jordan assistant manager”. Feedback on “Frank Stapleton announced as new Jordan assistant manager”.